Mountain Dew is on eYeka with a new great brief – “It doesn’t exist until you do it”! Mountain Dew challenges young guys to constantly dream up, create and activate awesome experiences without regard to success or failure, perfection or achievement, but because they result in a damn good time. Awesome experiences do not exist on their own, they only exist “when you Dew it”. 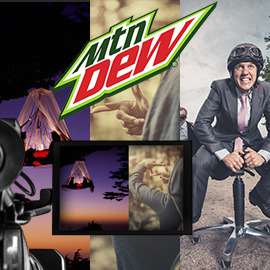 “Do the Dew” is a tagline and Mountain Dew’s ambition is to show its audience that it can be a way of life. Can you help? Create an energetic and engaging 30 or 120 second video that depicts “Dewers” - either individuals or a group of friends – as they go about creating a spontaneous “damn good time”. Format: video (less than 30 sec or more than 2 mins). Send ius your coolest videos before January 17, 2016 23:59 UTC ! Good luck!